* I'm thinking more about the framing of the photos--I look at the backgrounds, try to get closer to the main subject, and over-all think about more the whole picture. * I'm noticing more nature and things around my house. I hardly go out, so to get a picture of something new, I'm looking around me. I'm now excited about clouds, sunsets, sunrises, and any wild life I can find. I never noticed so much before. 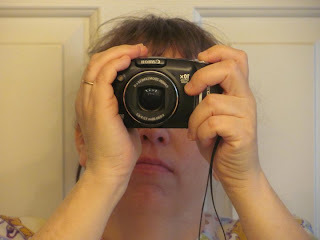 * I'm getting to know the settings on my camera really well! I know how I can push it with the zoom and other settings. I can almost tell you now when a flash will be needed and not. I know that I have to keep things still for a bit when I use the "sunset" setting. * I've learned from some research about how even professional photographers use the "Auto" settings on their cameras and photo editing software. I no longer feel embarrassed that I use "Auto" and "Easy" settings almost always. I am learning how to use the software to crop so something will zoom in and other neat features like tint, glow, and stuff. I'm surprised that I've learned so much by taking one interesting (hopefully) photo a day for six weeks. I'm looking forward to continuing my goal for the next 323 days.